"Disreputable if Not Outright Illegal": The National Security Agency versus Martin Luther King, Muhammad Ali, Art Buchwald, Frank Church, et al. 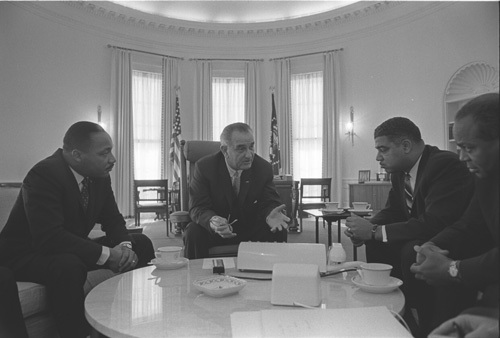 President Lyndon B. Johnson meeting with members of his civil rights cabinet on 18 January including, from left to right, Martin Luther King Jr., Whitney Young, and James Farmer. King and Young were both future targets of the NSA watch list system. (Photo from Lyndon B. Johnson Presidential Library, On-line Photo Archive, W425-21). Washington, D.C., September 25, 2013 – During the height of the Vietnam War protest movements in the late 1960s and early 1970s, the National Security Agency tapped the overseas communications of selected prominent Americans, most of whom were critics of the war, according to a recently declassified NSA history. For years those names on the NSA's watch list were secret, but thanks to the decision of an interagency panel, in response to an appeal by the National Security Archive, the NSA has released them for the first time. The names of the NSA's targets are eye-popping. Civil rights leaders Dr. Martin Luther King and Whitney Young were on the watch list, as were the boxer Muhammad Ali, New York Times journalist Tom Wicker, and veteran Washington Post humor columnist Art Buchwald. Also startling is that the NSA was tasked with monitoring the overseas telephone calls and cable traffic of two prominent members of Congress, Senators Frank Church (D-Idaho) and Howard Baker (R-Tennessee). The NSA history, American Cryptology during the Cold War, is a multi-volume study that covers the intersection of secret communications intelligence with Cold War history. 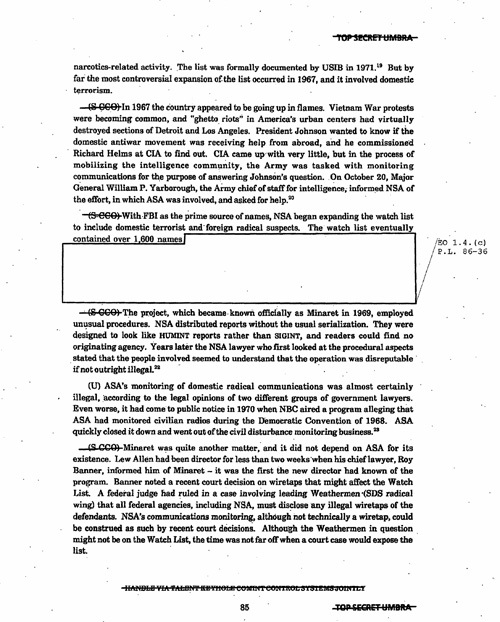 The National Security Archive filed the initial mandatory declassification review request for the histories in 2006. The next year, when the NSA denied significant information from the histories the Archive filed an appeal. 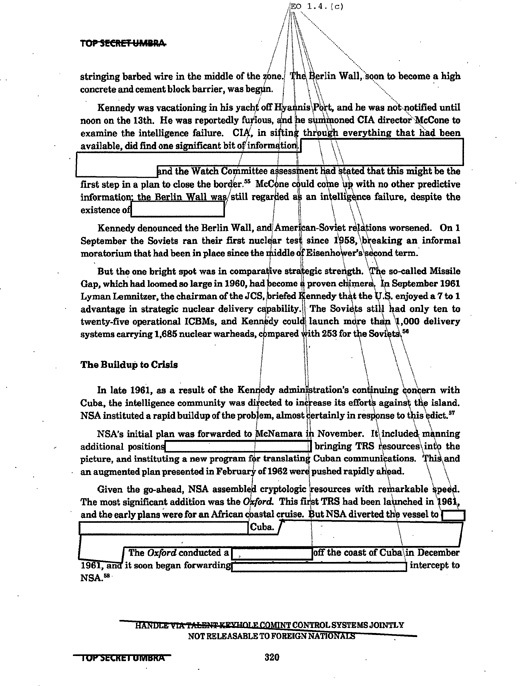 The Agency declassified more information in 2008 and the Archive posted the first three volumes on its Web site in 2008, with commentary by Matthew Aid. The NSA had denied so much, however, that the Archive filed a final appeal with the Interagency Security Classification Appeals Panel (ISCAP) that same year. Book I remains under appeal. Five years after the Archive's appeal, the ISCAP has compelled the NSA to release more information from Books II and III. 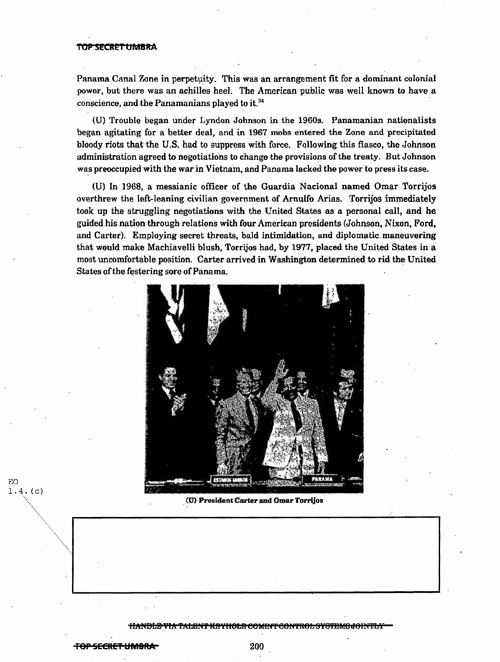 NSA wiretaps on Panama's president Omar Torrijos during the 1970s may have given U.S. diplomats an advantage in the negotiations that produced the Panama Canal Treaty. No American negotiator could have asked for more, and transcript after transcript arrived at the State Department full of Torrijos's latest instructions to his negotiators. Using the [signals intelligence], American negotiators Ellsworth Bunker and Sol Linowitz kept the treaty negotiations going at times when they were threatened with collapse. 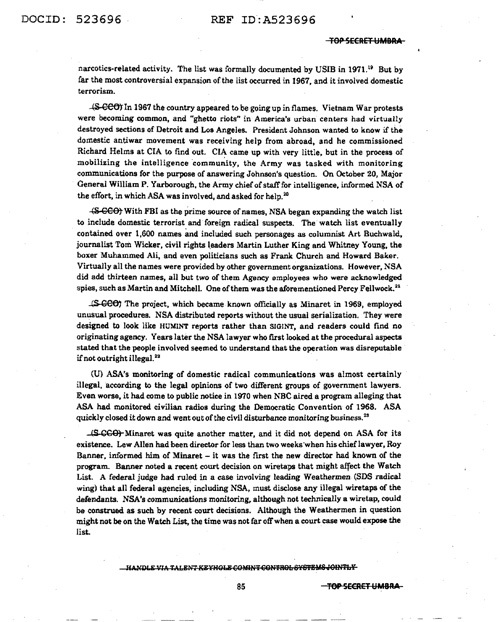 In its earlier release, the NSA declassified key elements of the story of its Vietnam War-era watch list and the MINARET program, but it held back details on the targets. ISCAP's decision to release the names of some of the prominent persons involved makes it even easier to understand why some NSA officials saw this operation as "disreputable if not outright illegal." (Book III, page 85). It was these concerns that led Attorney General Elliot Richardson to close down the program in the fall of 1973, as the Nixon administration was beginning to unravel. MINARET and other abuse of power, such as NSA Operation SHAMROCK, contributed to the drive for Congressional intelligence oversight and the Foreign Intelligence Surveillance Act (FISA) during the mid-1970s. What became known as the MINARET program had its basis in earlier efforts to create watch lists initially for suspected threats to the president, for drug dealers, and then, according to the NSA history, for "domestic terrorism." Specifically, in a context of domestic turbulence of 1967, anti-war protests and urban rebellions, President Johnson, angered by the criticism and prone to seeing conspiracies, wanted to know whether domestic anti-Vietnam War leaders and organizations had the support of hostile foreign powers ("Moscow gold"). Those concerns set in motion the CIA's Operation CHAOS and the NSA's watch list. Those at the FBI and other organizations who helped prepare the watch lists probably found it responsive to presidential wishes to include in the list domestic critics and influential politicians or controversial figures who opposed the War, even if they were not involved in mass protests. It would be fascinating to see the list of 1,600 or so NSA targets. No doubt, other African-American activists were targeted, as well as the leaders of groups associated with the anti-war protests, e.g. the National Mobilization Committee against the War in Vietnam, Students for a Democratic Society, and the Young Socialist Alliance. 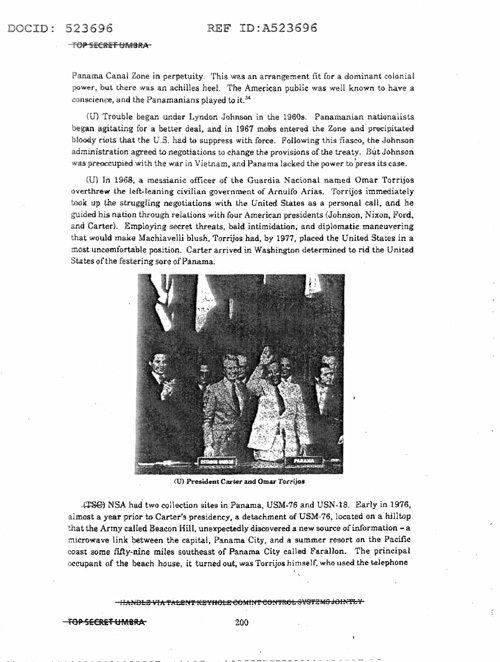 Indeed, according to a document at the Gerald Ford Presidential Library, from 1967 to 1973 U.S. intelligence agencies monitored the foreign travel and overseas communications of anti-war and New Left activists such as David Dellinger, Rennie Davis, Jane Fonda, Tom Hayden, Bernardine Dohrn, and Kathy Boudin, as well as prominent African-American militants including Robert F. Williams, Eldridge Cleaver, and Stokely Carmichael. The NSA watch list is not mentioned but it is implicit in the document. In addition, a number of prominent Americans appeared on the MINARET watch list precisely because in one way or another their thinking dovetailed with the emerging Vietnam War protests. With the intelligence agencies under White House pressure to find out the alleged international connections of anti-war leaders, U.S. intelligence agencies cast a wide net in their efforts to meet the President's wishes. Even the most unlikely names would become targets perhaps because they were prominent, influential, and had expressed what the President considered subversive thoughts. Most, but not all, of the prominent Americans mentioned in the now declassified NSA history fell into this latter category. Martin Luther King's status as an NSA target has been known since the 1970s; nevertheless, this is probably the first time that the U.S. government has declassified it. When the watch list was created in 1967, King was already an outspoken critic of the Vietnam War. He had become the target of FBI wiretaps not long after the 1963 March on Washington; Attorney General Robert Kennedy approved the wiretaps because of allegations about King's connections with the Communist Party. One of King's chief advisers was former Communist Party member Stanley Levinson, who had been under the Bureau's scrutiny for years. But even after King began keeping distance from Levinson the wiretaps continued and expanded, part of a generalized FBI effort to destroy King's effectiveness as a civil rights leader. Presumably his name appeared on the watch list in 1967, around the time it was created, because King was already speaking out against the Vietnam War. Urban League president Whitney Young may have become an NSA target because of his later opposition to the Vietnam War. One of the most cautious of the major civil rights leaders, Young was a member of the informal White House "civil rights cabinet," had a good relationship with President Johnson, initially avoided criticism of the Vietnam War, and, in contrast to Martin Luther King, was not a target of FBI surveillance. According to J. Edgar Hoover, Young was a "very expedient person" who had a "cooperative attitude toward the Bureau." As for Richard Nixon, Young privately objected to Nixon's Southern Strategy but tried to develop a modus vivendi with the White House on programs to address the urban crisis. During 1969, however, Young publicly turned against the Vietnam War by endorsing the October 15 Moratorium. The war, he argued, was "tragically diverting America's attention from its primary problem-the urban and racial crisis-at the very time that crisis is at [a] flash point." Whether that prompted some government official to add Young to the MINARET list remains to be seen. The late Tom Wicker was the Washington, D.C. bureau chief for The New York Times during the 1960s; he produced a regular column for many years. The Times editorial writers were early critics of the War: by calling for "de-escalation" they angered Johnson, who believed that they "wanted him to lose the war." At one point Johnson was quoted as saying "I can't fight this war without the support of The New York Times." 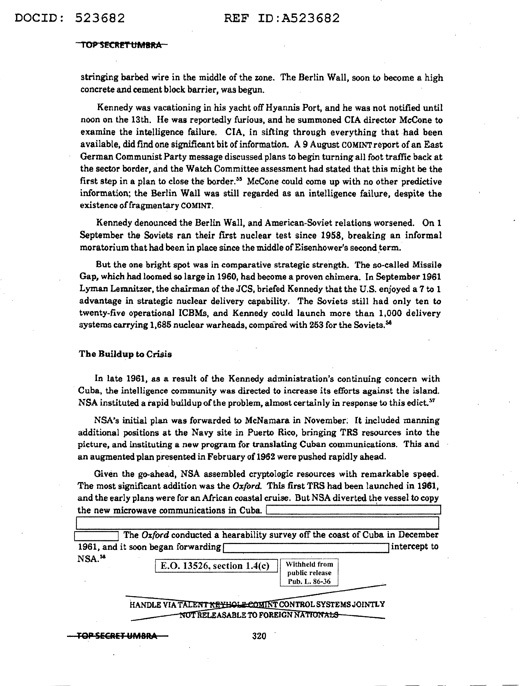 By 1967, when the NSA watch list was under way, Wicker was writing columns deeply critical of the war, arguing that it had "blunted and all but destroyed the hopeful beginnings of the Great Society," "strained" U.S. international relations, "reduced prospects of détente", and "added to the climate of violence in the world and raised the dread possibilities of wider war." Wicker's criticisms of the war continued and the Nixon White House put him on its "enemies list"; if Wicker was not already on the watch list he surely was by 1969. Another NSA target was Senator Frank Church, who started out as a moderate Vietnam War critic. A member of the Senate Foreign Relations Committee even before the Tonkin Gulf incident, Church worried about U.S. intervention in a "political war" that was militarily unwinnable. While Church voted for the Tonkin Gulf resolution, he later saw his vote as a grave error. In 1965, as Lyndon Johnson made decisions to escalate the war, Church argued that the United States was doing "too much," criticisms that one White House official said were "irresponsible." Church had been one of Johnson's Senate allies but the President was angry with Church and other Senate critics and later suggested that they were under Moscow's influence because of their meetings with Soviet diplomats. In the fall of 1967, Johnson declared that "the major threat we have is from the doves" and ordered FBI security checks on "individuals who wrote letters and telegrams critical of a speech he had recently delivered." In that political climate, it is not surprising that some government officials eventually nominated Church for the watch list. Washington Post humor columnist Art Buchwald said that he was unhappy that he never made Nixon's enemies list, but he probably would been troubled to learn that he had been a MINARET target. Buchwald had influence through his comic writing, and when he began to address the Vietnam War he irritated someone enough to get on the watch list. For example, in a column from 1966, Buchwald noted a recent Post story that it cost the U.S. government about $332,000 to kill an enemy soldier in Vietnam. Buchwald suggested a variety of solutions that he believed would be far cheaper, for example, offering defectors a $25,000 home, plus a color TV, education for their children, and a country club membership. In another column, he made fun of Secretary of State Dean Rusk's statement that the U.S. was fighting in Vietnam to "contain Red China." Picturing two Vietnamese peasants discussing Rusk's statement, one asked "why don't the Americans bomb China instead of us?" The other replied "Because that would get China into the war, and the United States doesn't want China in the war, stupid." Perhaps some humorless FBI or White House official put Buchwald on the watch list. Heavyweight boxing champion Muhammad Ali probably became a target because of his comments about the Vietnam War and his efforts to avoid the draft. A member of the Nation of Islam, during 1966 and 1967 Ali, then more widely known by his birth name Cassius Clay, appealed his 1-A draft status (fit for immediate induction) on the grounds that he was a Muslim minister. He had publicly stated that "I've got nothing against them Vietcongs" and "I can fight in wars declared only by Allah himself." Losing his appeal for conscientious objector status, Ali refused induction and was sentenced to five years' imprisonment. In the meantime, he was stripped of his title. Despite his declaration that "I am free to be what I want," Ali was widely criticized as a "draft dodger" and a "traitor," perhaps that led the FBI or some other agency to put him on the watch list. While initially losing the appeals of his conviction, Ali took his case all the way to the Supreme Court, which in 1971 reversed the conviction, ruling that he was entitled to conscientious objector status. Ali was free to resume his career; how long his name remained on the NSA watch list is unclear. The real mystery is why Senator Howard Baker ever became a target for NSA. A strong supporter of the Vietnam War, Baker criticized the Johnson administration for insufficient bombing of "primary targets and asked for a clearer declaration of war aims." He consistently defended the Nixon administration's Vietnam policy. Perhaps some of his overseas communications were picked up because during the 1960s and the early 1970s the NSA had a practice of reporting to Presidents Johnson and Nixon what "prominent Americans were saying and doing abroad." For background on the Pentagon papers and the NSA role, see John Prados and Margaret Pratt Porter, Inside the Pentagon Papers (Lawrence, KS, 2004). John Dinges, Our Man in Panama: The Shrewd Rise and Brutal Fall of Manuel Noriega (New York, 1991), 81-83. That the phrase "domestic terrorism" was used at that time in reference to the anti-war protests is unlikely; it is probably an erroneous usage by the NSA historian. For CHAOS, see Tom Wells, The War Within: America's Battle Over Vietnam (Berkeley, 1994), 183-184, 204-210. Memorandum, James A. Wilderotter to Rumsfeld/Cheney et al., 13 May 1975, Gerald R. Ford Library, Ann Arbor, Michigan. David Kahn, "Big Ear or Big Brother? ", The New York Times Magazine, 16 May 1976. For the FBI's war against Dr. King, see David Garrow, Bearing the Cross: Martin Luther King Jr. and the Southern Christian Leadership Conference (New York, 1986). See also "After Martin Luther King's 1963 Speech, FBI Began Spying on Civil Rights Leader," The Washington Post, 26 August 2013. Dennis C. Dickerson, Militant Mediator: Whitney M. Young, Jr. (Lexington, KY, 1998), 261, 281; Nancy J. Weiss, Whitney M. Young and the Struggle for Civil Rights (Princeton, 1989), 191-204. Susan E. Tifft and Alex S. Jones, The Trust: The Private and Powerful Family Behind The New York Times (Boston, 1999), 442; Wicker, "In the Nation: A Grim Cost Analysis," The New York Times, 24 August 1967; "Lists of White House 'Enemies' and Memorandums Relating to Those Named," The New York Times, 28 June 1973. LeRoy Ashby and Rod Gramer, Fighting the Odds: The Life of Senator Frank Church (Pullman, WA, 1994), 182-184 198, 249; Randall B. Woods, LBJ: Architect of American Ambition (New York, 2006), 675, 727-728. Art Buchwald, "Price Per Head," The Washington Post, 1 January 1967; "Vietnamese Learn From Rusk It's Red China We're Fighting," Ibid, 19 October 1967. In a column from October 1969, Buchwald noted that the White House selected a Georgetown University student, who had written a critical letter about the war, to be the recipient of a reply from President Nixon about the student protests. As it turned out, the student was a monarchist! Buchwald turned the elements of truth into comedy: the mortified White House asked the FBI what it knew about the monarchist movement in the United States. FBI director J. Edgar Hoover was "embarrassed to admit he didn't have too much in his files on the royalists … 'Frankly, our department doesn't even have any phone taps on them.'" Perhaps the joking references to wiretaps helped put Buchwald on the NSA watch list. See "Monarchist Plot: Red-Faced FBI Admits It Hadn't Tapped Royalists' Phones," Ibid, 19 October 1969. "Clay Remains Classified 1-A," The New York Times, 13 January 1967; "Clay Loses Appeal in Draft Case," The Washington Post, 7 May 1968; Steve Cady, "Winner by Decision: Muhammed Ali," The New York Times, 29 June 1967.